Filipino travellers will get to experience first-hand the comfort and innovative design of Singapore Airlines’ (SIA) Next Generation Cabins at the Singapore Airlines Showcase that opened today, February 21, 2014 at the Glorietta 2 Activity Center in Makati City. In partnership with BPI Express Credit, Ayala Malls, Globe Telecom, British Council and Singapore Tourism Board, Singapore Airlines unveiled its new First, Business and Economy class cabin products at the exciting and unique showcase, which is open from February 21 to 23, 2014 only. Singapore Airlines has been flying in the Philippines for 48 years now. Before, their Manila operations started with three flights a week, but today, they are flying four (4) times daily. “We’ve always been committed to make air travel more comfortable and hassle-free, which is why we have been investing heavily in our aircraft, products and services. We’ve brought in the next generation seats for everyone to try before they fly. These new cabins are the result of more than two years’ worth of efforts and we are proud of the feedback that we are getting so far,” said Mr. Philip Goh, Singapore Airlines’ Regional Vice President for Southeast Asia. Setting the new industry standard for premium air travel, Singapore Airlines has made significant innovations in its cabin designs in collaboration with world renowned design companies. The New First Class has been designed together with BMW Group DesignWorks, and the new seats and beddings have been restyled with exquisite details that transform into a more exclusive experience. The New First Class boasts of a personal 24-inch LCD screens, longer and wider seats, padded headboards and an additional mattress layer. Lights on each side of the seat have three different intensities of lighting to suit different passengers’ needs at varying positions in both seat and bed modes. The New Business Class seats are designed together with James Park Associates, which now sport a more contemporary design with a curvaceous shell, metallic colors, and luxurious soft furnishings. The New Business Class seats are still the widest in the sky, featuring greater recline with new seating positions and an all-in-one business panel. Similar to the New First Class, the New Business Class also has varying lighting options to suit every passenger’s mood. The New Economy Class is more comfortable than ever with more knee and leg room, a unique and moveable headrest, plush seat cushions featuring bolstered sides for increased sitting comfort and in-seat power supply to charge and connect personal devices. Completing the experience is SIA’s New KrisWorld In-Flight Entertainment System which offers passengers a truly pleasurable experience on-board. With the innovative features of Panasonic Avionics next-generation eX3 system, passengers across all seat classes can now enjoy their favorite movies, TV shows and games on a larger and high-definition LCD and touch-screen handsets. KrisWorld LCD screens increased from 23 to 24 inches in First Class, 15.4 to 18 inches in Business Class and 10.6 to 11.1 inches in Economy Class. The Singapore Airlines Showcase treads on the heels of an ongoing promotion which began last February 1. Under the Singapore Airlines Exceptional Value All-in Fares promotion, the airline is offering roundtrip economy class tickets to various destinations within its wide network, including fares that start from only USD 150 to Singapore and USD 888 to 12 cities in Europe among others. “The Exceptional Value promotion is our way of thanking travellers from the Philippines for their support as well as a means to encourage more and more Filipinos to travel by air. By giving them greater access to premium air travel, we want Filipinos to realize that, with Singapore Airlines, the journey would be as wonderful as the destination,” added Ranjan Jha, Singapore Airlines’ General Manager for the Philippines. These exceptional, all-in value fare offers are available until February 28, and travel period is from now until October 31, 2014. 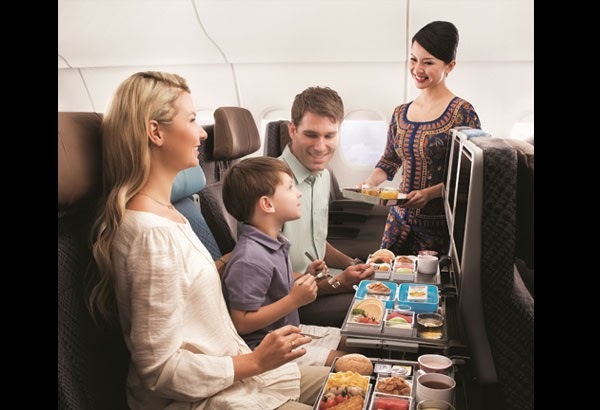 For more details on the Singapore Airlines Showcase and all-in value fare offers, visit www.singaporeair.com.